63 y.o. male with severe spinal stenosis and associate myelopathy in both hands and feet. Patient underwent laminectomy from C2-C7. 1 day after initial operation patient with severe numbness to left arm. Then, patient became unable to move either leg within 2 hours after that initial complaint. 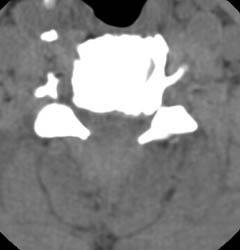 A Stat non-contrast CT was ordered. 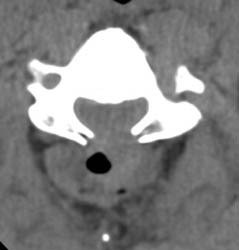 Axial CT demonstrates laminectomy defect at the level shown. A hyperdense fluid collection with some air bubbles is identified consistent with an epidural hematoma, extending from the C2-3 level to C7-T1 (not entirely shown).